Drumming is one of the most distinctive woodpecker sounds, and birders can easily learn to recognize the patterns and rhythms of woodpecker drumming to help identify woodpeckers. 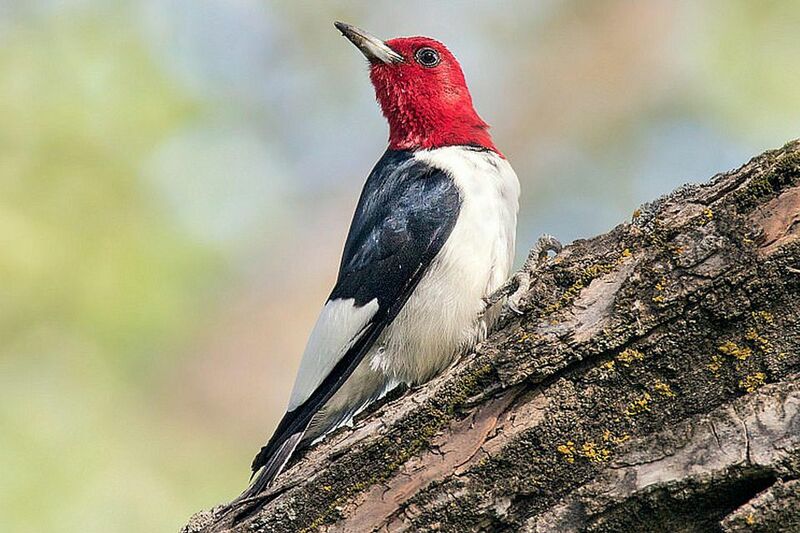 Understanding why woodpeckers drum can help birders expand their appreciation of these useful bird sounds and the birds that make them. Smaller woodpeckers generally opt for smaller objects to drum on, while larger, more powerful woodpeckers use larger objects with greater sound resonance. The exact pattern of the drumming will vary in tempo, length, and rhythm depending on the woodpecker species, and most species have distinctive drumming sounds and patterns. Woodpeckers have special physical adaptations that allow them to peck quickly and repeatedly on hard objects without hurting themselves. Thicker skulls cushion the birds' brains and heads from hard impacts, and strong neck muscles allow them to drum for long periods of time without strain. Their bills are also thick, straight, and sturdy to withstand drumming impacts. Stiff bristles at the base of the bill help catch small bits of wood or dust particles stirred up by drumming so the birds' eyes are not irritated. In addition to these primary reasons, drumming can also be more localized communication. Mated woodpeckers may use drumming to let one another know about a food source or to summon help at the nest. A woodpecker may also drum to raise an alarm about a predator lurking nearby. When a woodpecker drums on a resonant object, the resulting sound can be heard for great distances by other birds. Other woodpeckers will recognize the sound by its pattern and tempo, and birds of the same species can be attracted to potential mates through drumming. At the same time, drumming alerts competitors that the nearby territory is claimed and can be defended by a strong, vibrant bird that can produce good drumming. The quality of the drumming, including its volume and number of repetitions, all help advertise the health, strength, and dominance of the bird making these woodpecker sounds. Just like bird songs, drumming is most common in late winter and early spring when birds are trying to attract mates and establish territories. Woodpeckers frequently drum in the morning, though some drumming may be heard at any time of day. Both male and female birds have been known to drum. While drumming can be fascinating for birders trying to bird by ear or interested in learning more about woodpeckers, it can also be frustrating when woodpeckers drum on a house or shed. Repeated drumming can leave a series of small, shallow holes in wood surfaces such as siding, eaves, or shingles, and those holes can lead to greater damage from insects or moisture. Even sturdier surfaces, such as metal gutters or soffit, can be dented, scratched, and damaged by determined woodpeckers. Fortunately, it is easy to discourage most woodpeckers from drumming on inappropriate surfaces. Dangling Mylar strips or moving ribbons can scare birds away from the area where they would drum. Covering the affected area will keep birds away because they cannot reach the surface to start drumming. Securing loose boards will minimize resonance to make the surface less attractive for drumming. Scare tactics such as loud noises or fake predators can also help keep woodpeckers away, all without hurting the birds. Knowing why woodpeckers drum can help birders appreciate the uniqueness of these birds and their behavior. Meanwhile, understanding drumming can help homeowners protect their property from woodpecker damage without resorting to less bird-friendly methods. Drumming is one of the most recognizable and unique woodpecker sounds, and the more you know about it, the more you will enjoy this unique rat-a-tat-tat every time you hear it.